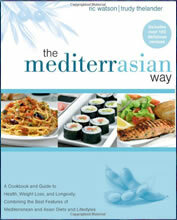 The MediterrAsian Way is an eating program that highlights the best features of both the Mediterranean and Asian diets and lifestyles in regard to their beneficial effects on health and weight management. It is promoted as a recipe book and while about half of the book is devoted to recipes it also contains a comprehensive dietary plan. The authors entice dieters with the promise of being able to eat delicious foods such as pizza, noodles, sushi, and curries ‘all washed down with a glass of your favorite wine or beer’. They state that this way of eating will not only help dieters to stay lean and healthy but will also reduce the risk of many diseases and may actually increase lifespan. There are many similarities between Mediterranean and Asian cultures and a bulk of scientific evidence indicates that these factors are probably responsible for the superior health of cultures that eat in accordance with traditional dietary practices. They consume a large amount of plant foods including grains, vegetables, fruits, legumes and nuts. Fish is included in the diet on a regular basis. The majority of the fat in the diet comes from vegetable or fish oils. Consumption of red meat and animal fats is low. Alcohol is consumed often in moderation and usually with meals. They have physically active lifestyles. They have a strong social support system, an optimistic outlook, and always set aside some time each day for relaxation. Calorie counts for the suggested meals work out to about half that of a typical Western style meal. The portions are generous, however, the inclusion of a large amount of fruit and vegetables means that the calories remain relatively low while the nutritional quality is high. Whole grain carbohydrates, fruit, vegetables, legumes, nuts, avocado,olive or vegetable oils, lean poultry, seafood, and tea. Alcohol in the form of wine or beer is allowed in moderation. Find Mediterranean recipes and Asian Recipes here. The Mediterranean and Asian lifestyles generally involve a lot of activity and exercise is promoted as a way to improve health by strengthening the heart and boosting immunity as well as for weight loss. Dieters are encouraged to increase activity in their daily lives wherever possible such as walking the dog, playing with their children in the park, or doing some gardening. For those who prefer a more structured program, activities such as tennis, golf, martial arts, tai chi, or yoga are suggested. Try these exercises as part of the MediterrAsian Way. The MediterrAsian Way retails at $27.50. Encourages the intake of a wide variety of nourishing unprocessed foods. Meals are balanced with a mix of fruit, vegetables, low glycemic carbohydrates, proteins, and healthy fats. The large amount of variety in the will alleviate dietary boredom while also promoting the intake of a wide range of nutrients and phytochemicals. Emphasizes the importance of physical activity and stress management for health and weight management. Can be maintained as a healthy lifestyle eating program. Encourages the intake of processed soy food, which does not reflect the philosophy of adhering to traditional dietary practices. Overemphasizes the consumption of carbohydrates such as cereals, bread, pasta, and rice. Does not provide calorie and nutrient breakdown for recipes. There is certainly a large amount of scientific evidence to support this style of eating and in particular it may be suited to those with a history or risk of diabetes and cardiovascular disease. However, even many of these dieters will not respond well to the high carbohydrate content of the diet particularly in the form of grains such as bread, pasta, and rice. The strength of this program is in the way it considers factors such as physical activity and stress management as being of utmost importance to health and weight loss, rather than just looking at the dietary aspects. For dieters who respond well to this way of eating this program may be maintained as a beneficial healthy lifestyle plan.